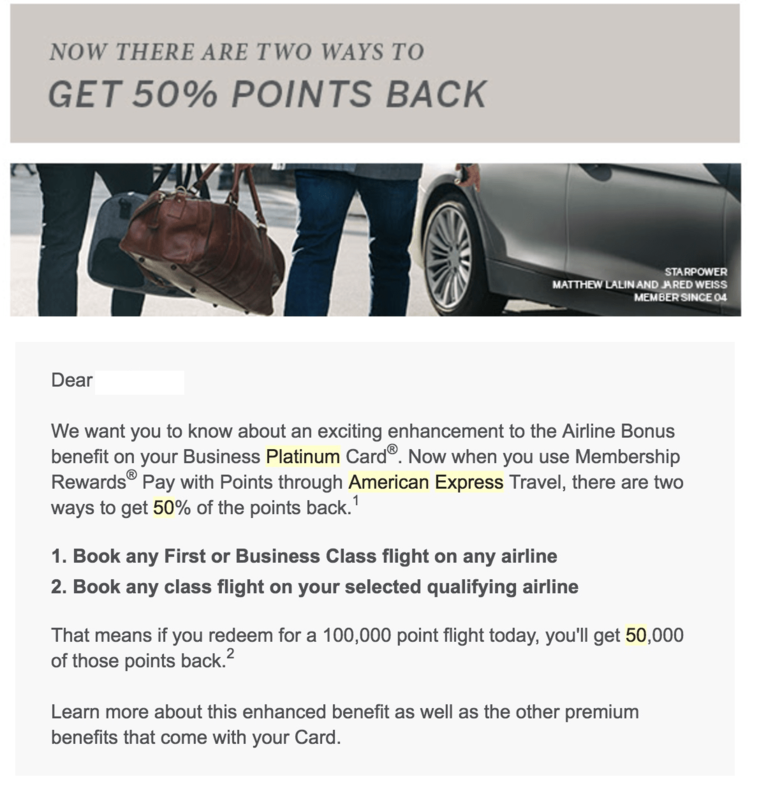 I have been pretty critical about AmEx and its response to the CSR, but I’ve got to tell you this new 5x MR on flight booking for personal Platinum (not biz) along with this new benefit on the Business side of 50% MR back on booking got me interested in MR point redemption strategy. I read this article from the points guy, and he got me back in the AmEx MR fanboy club. 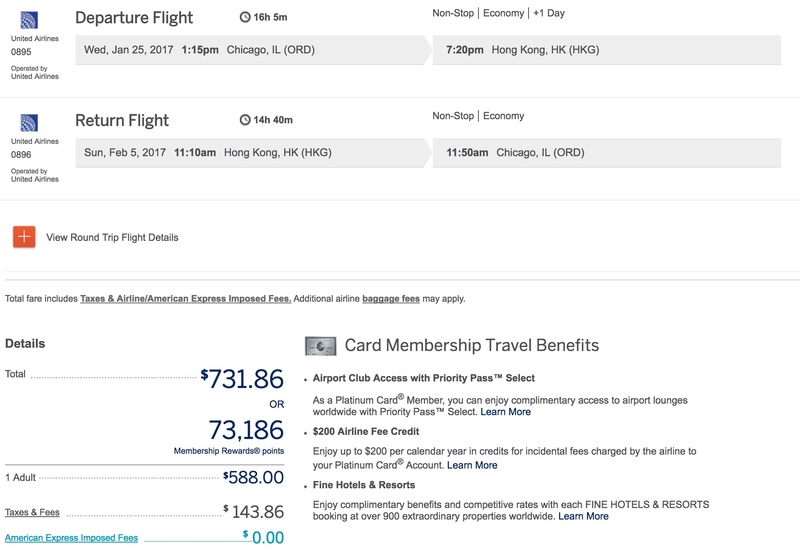 I am sending my mom to Hong Kong round trip for 36,593 MR points which is 2 cents per MR point when compared to buying the flight direct from United for $731.86. Also, United wanted 80,000 MP miles and $58.16 making the redemption less than one cent per mile. Any time you get less than one cent per mile for United, you know it’s a terrible deal. It also applies to booking business and first class tickets on any airline, not just the selected one, but I don’t see myself doing this anytime soon. This 50% points back is on the business and not the personal version, but the personal version has 5x MR on booking directly. If you are on the fence about getting your own Business Platinum Card, click here for the 100,000 MR point offer. 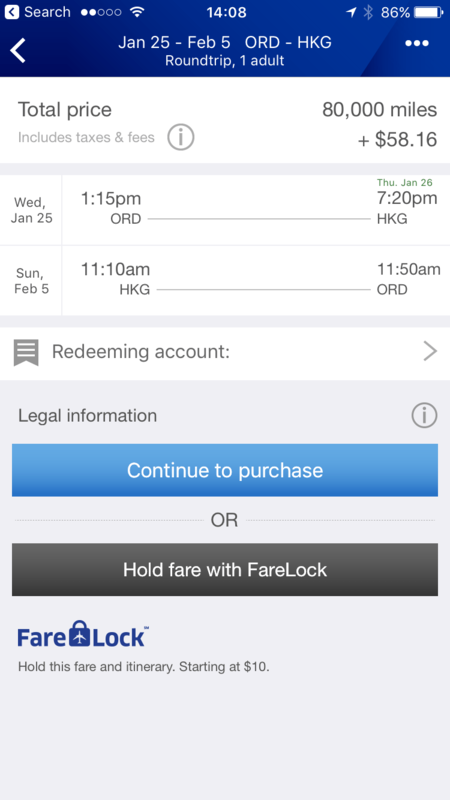 This would allow you to book 3 round trip tickets from ORD to HKG worth $2,195.58 in travel. When booking on the MR Travel site, I will be initially charged $731.86 directly from United on my Business Platinum, then 73,886 MR will be deducted and a credit is placed in the account. A few days later, I will get 50% posted back to my account. Since it’s not an award flight, I get all the miles and status upgrades on the flight as far as United is concerned. Earn 50,000 Membership Rewards® points after you spend $5,000 and an extra 50,000 points after you spend an additional $10,000 all on qualifying purchases on the Business Platinum Card within your first 3 months of Card Membership. Offer expires January 25, 2017. I am enjoying my Business Version of the AmEx Platinum because, let’s face it, everyone has the personal one, and it’s simply looking a bit basic, something that a JO might have but never a senior officer! The current AmEx Platinum Business holders I know are all O-4s and O-5s. I might be the only O-3 with one, but that is soon to change. I guess its something you learn at AMDOC; I can only assume every flag officer is issued the AmEx centurion at their wetting down. Really, I get all of the basic Platinum offerings as well as my 10 gogo wifi certs on top of getting into AmEx OPEN lounges at the convention center. The best part is the annual fee of $450 is also waived for active duty. The game has changed! I linked up all my MR earning cards to the same account, so MR points from my Every Day Preferred Rewards, MB Plat, Regular Plat, Preferred Rewards Gold, and this Business card can be pooled and used to book on this one card at 2 cents per MR point! 1To use Pay with Points, you must charge your eligible airfare purchase through American Express Travel to a Membership Rewards® program-enrolled American Express® Card. Points will be debited from your Membership Rewards account, and credit for corresponding dollar amount will be issued to the American Express Card account used. If points redeemed do not cover entire amount, the balance of purchase price will remain on the American Express Card account. Points must be used at the time of booking. Pay with Points requires a minimum redemption of 5,000 points. Business Platinum Card Members will receive 5 extra points for every 10 points they redeem for either a First or Business class flight on any airline, or for flights with their selected qualifying airline using Membership Rewards Pay with Points with American Express Travel (50% Airline Bonus). For First or Business class flights on a Card Member’s selected qualifying airline, the Card Member will still receive only 5 extra points for every 10 points redeemed. 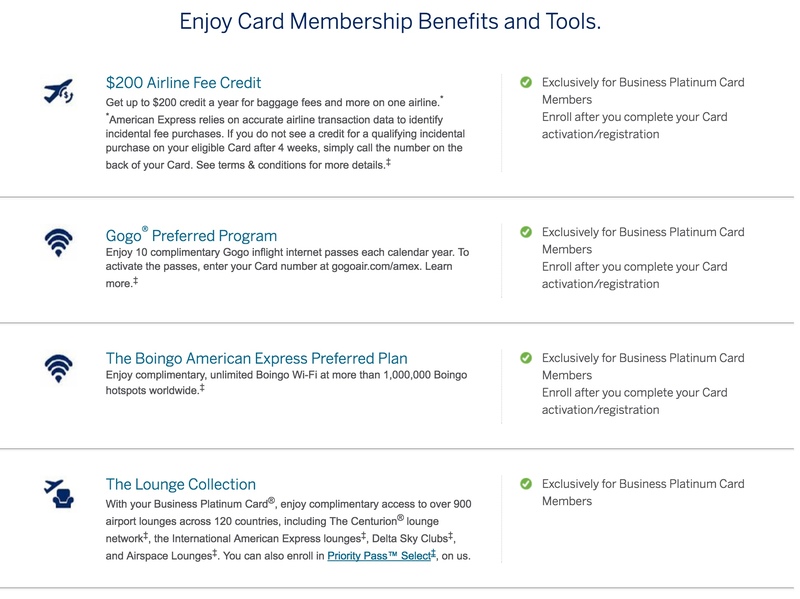 Card Member must select a qualifying airline at www.americanexpress.com/airlinechoice. Only the Basic Card Member or Authorized Account Manager(s) on the Card Account can select the qualifying airline. 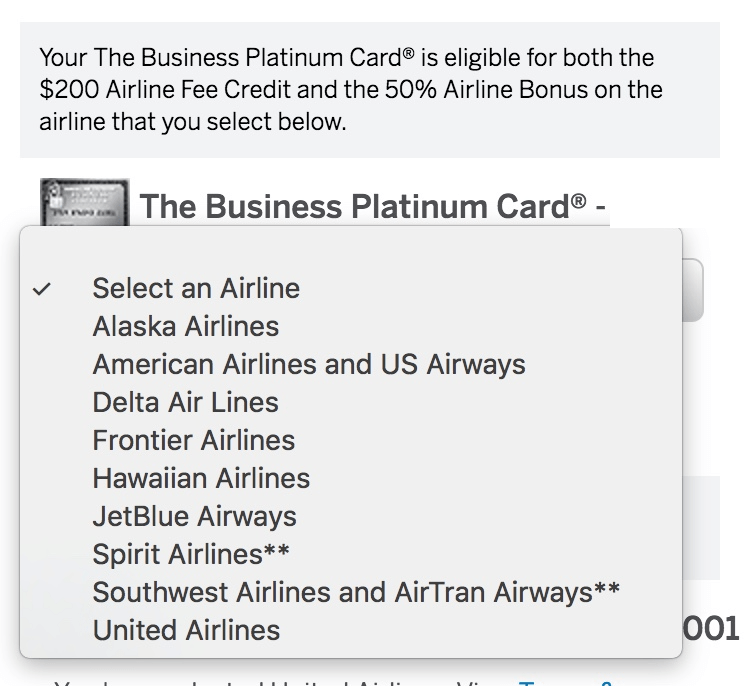 The airline you select for the 50% Airline Bonus and the $200 Airline Fee Credit must be the same. Card Members who have not chosen a qualifying airline will be able to do so at any time. Card Members who have already selected a qualifying airline will be able to change their choice one time each year in January at www.americanexpress.com/airlinechoice or by calling the number on the back of your Card. Card Members who do not change their airline selection will remain with their current airline. If you select Spirit Airlines, Southwest Airlines, or AirTran Airways, to receive your 50% Airline Bonus you must call Business Platinum Travel Service at 1-800-553-9497. 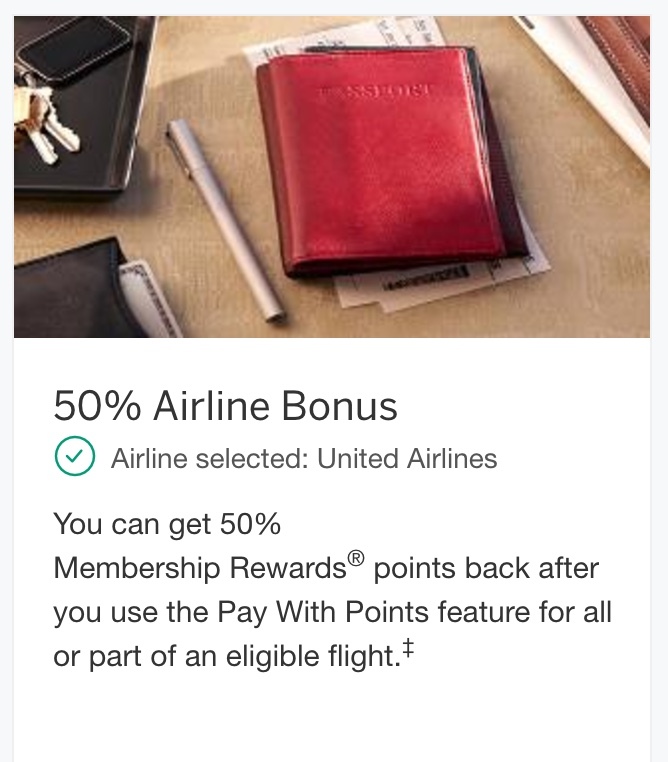 A flight booked as part of a travel package or booked with the American Express U.S. Representative Travel Network is not eligible for the 50% Airline Bonus. In addition, to be eligible to receive extra points, Card account(s) must not be in default at the time of extra points fulfillment. If booking is canceled, the extra points will be deducted from your Membership Rewards account. Extra points will be credited to your Membership Rewards account approximately 6-10 weeks after charges appear on your billing statement. See membershiprewards.com/terms for Membership Rewards program terms and conditions. This 50% Airline Bonus is the maximum Membership Rewards points you can get back for Pay with Points on flights booked with American Express Travel. 2Terms and Conditions for the Membership Rewards® program apply. Visit membershiprewards.com/terms or call 1-800-AXP-EARN (297-3276) for more information. Participating partners and available rewards are subject to change without notice. I am so glad that I didn’t use all those MR points on Lettuce Entertain You gift cards like I did as a stupid youth. Go for the Business Platnum before the 100k offer is gone.